University City Community Association (UCCA) members and board participated in a lively conversation about short term vacation rentals (STVR) at the April UCCA meeting, led by La Jolla Town Council president Ann Kerr-Bache. 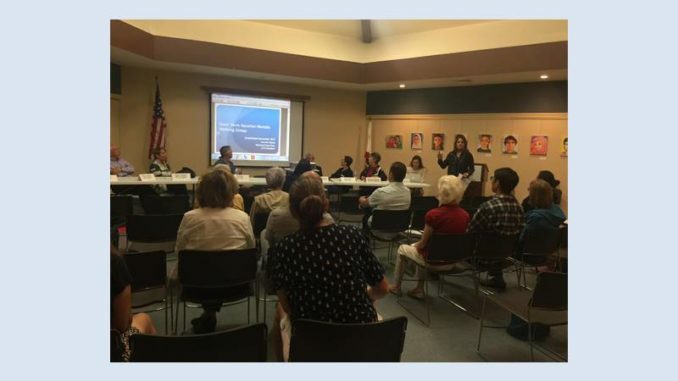 In November 2017, the La Jolla Town Council (LJTC) held a forum on STVR with other Town Councils, Associations, and concerned citizens. The outcome was the formulation of the San Diego Coalition of Town Councils, which chartered a Working Group on STVR. The STVR Working Group, with many years of knowledge and experience, has developed a concise set of Recommendations for Regulations for Short Term Vacation Rentals. After the presentation and discussion, UCCA’s board, with the input of those in attendance, voted to support the San Diego Coalition of Town Councils and the efforts of the STVR Working Group to develop sensible and safe neighborhood STVR recommendations. UCCA Board member Mack Langston will be UCCA’s representative to the Working Group.